Get tips, tools, and strategies for supporting a child in your life with their sensory processing development. This offer is 35% off amazing digital sensory products. It is designed to help parents, teachers, and therapist, but ultimately, it is designed to equip them to help children. Improve your child’s emotional regulation and behaviours. Make morning battles a thing of the past. Parents need quick solutions that actually work to deal with meltdowns at home and figuring out what their child’s behaviour is trying to tell them. Teachers need strategies that they can use in a busy classroom with multi-level students that are budget-friendly and work in small spaces. Therapists need trusted information that they can share with their families and educators about how sensory challenges can best be met. And they need handouts, checklists, and cheat sheets they can easily pull out and share without having to re-create the wheel. The Sensory Essentials Collection has everything necessary to equip you with the skills and knowledge you need to help your child today. Sensory Processing Explained – A Handbook for Parents and Educators (value $17.99) – 177 page handbook for parents and educators to feel confident in understanding sensory processing. Visual Schedule for Special Needs (Valued at $12) – 25 page digital download includes 66 printable cards in black and white and 66 printable cards in colour. 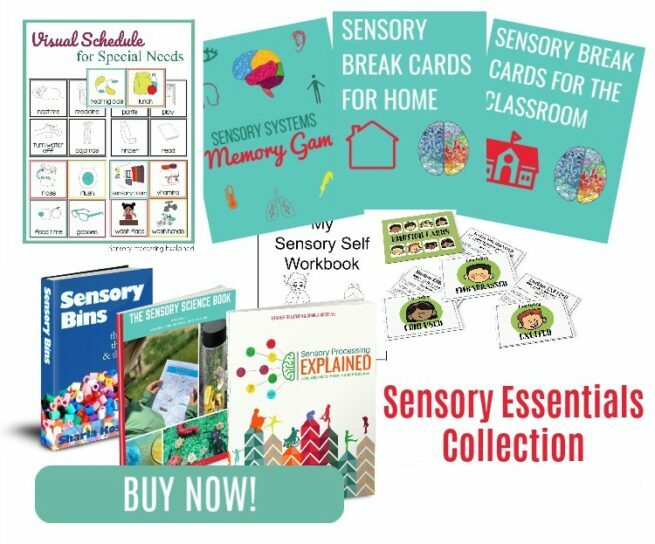 Sensory Science Book – Volume 1 (valued at $12) – 30 page digital download. explore 3 themes of science using hands-on experiments and activities using all 8 senses. each theme contains 5 activities that focus on Colors, The Senses, and Nature. children retain knowledge better with hands-on sensory based learning. incorporate sensory bins into your home, classroom, preschool, Day Care, or homeschool. My Sensory Self Workbook (Valued at $5) – 16 page digital download. 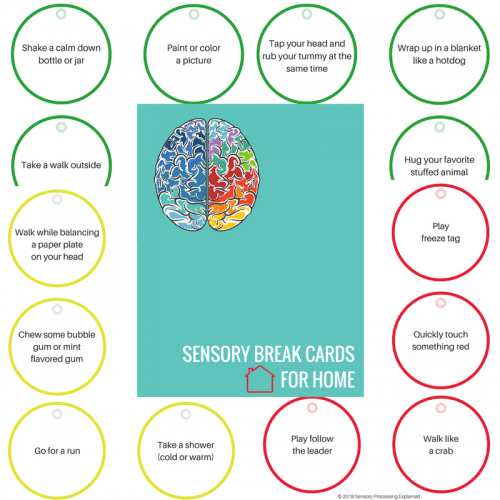 Sensory Break Cards for Home (Valued at $5) – 52 printable sensory break cards for home. activities are divided into green cards for calming, red cards for alerting, and yellow cards that can be both alerting or calming activities. 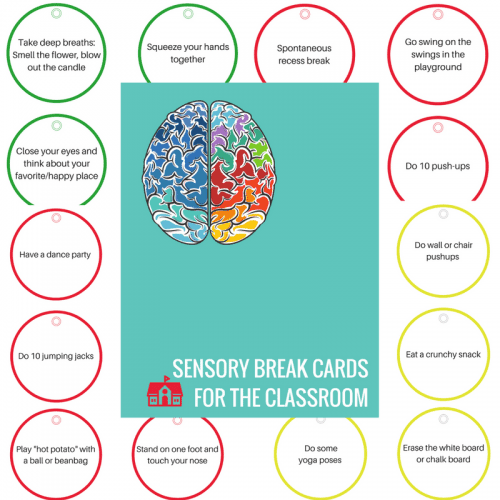 Sensory Break Cards for the Classroom (Valued at $5) – 47 printable sensory break cards for the classroom. designed to be used with minimal sensory tools or easy, DIY options, use in small spaces, and with multiple children. activities are divided into green cards for calming, red cards for alerting, and yellow cards with activities that can be both alerting or calming. Emotions Cards (Valued at $10) – 12 printable visual emotion cards. each card also includes caregiver and educator tips on the back to help your child understand and regulate their emotions. 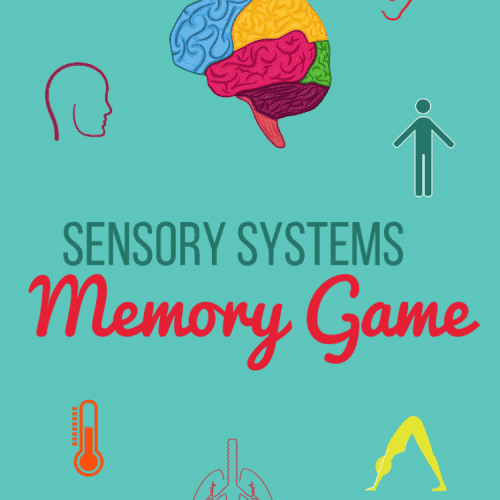 Sensory System Memory Game (Valued at $5) – 5 page digital download. this fun matching game helps children identify and learn about the 8 sensory systems.